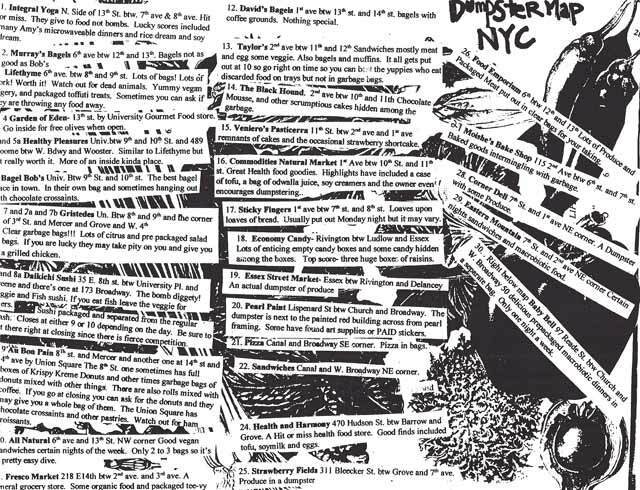 In 2001 I helped create what was possibly the first map and guide for would be dumpster divers of NYC. The map was added to Tamiment Library Archives at NYU in 2009. 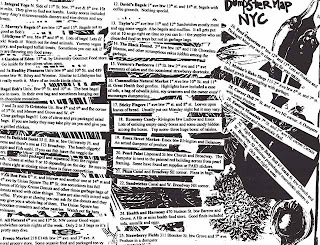 In the lead up to the 2004 Republican National Convention (RNC) in NYC I created a far more extensive multi-page dumpster diver's guide to the city. More than a thousand copies were printed and distributed freely. The contents of the guide are available online in the expanded listing maintained by the local Freegan group. I've led introductory dumpster diving tours as part of the Time's Up! Bike National Convention, and at other times. On one such tour, I was joined by journalist and author Jennifer Blowdryer, who wrote about my “Dumpster Diving Spots of NYC,” and the tour in NYPress. 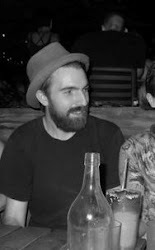 Beyond just mapping out or listing dumpster diving locations, I promoted dumpster diving as a way to enjoy an anti-capitalist diet. Jessica Rockstar and I were the main subjects, along with Brad Will and members of the Activism Center at Wetlands / Freegan.info of a documentary called "Dumpster Diving" that was part of the PBS television show Life 360. I was also part of a radio story on the subject that was on the WNYC show The Next Big Thing.